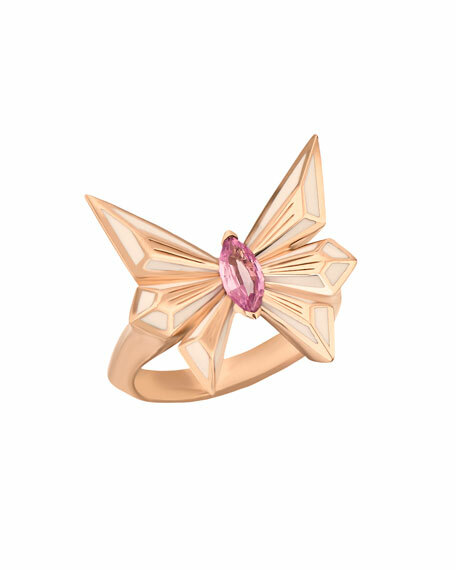 Stephen Webster ring from the Fly by Deco Drive Collection. Batwings with inset white enamel. North-south marquis pink sapphire at center. 0.37 total pink sapphire carat weight. "Rumi Burst" adjustable necklace by gorjana. Polished 18-karat gold-plated brass hardware. Five marquise-cut dangles in cubic zirconia and Opalite® opalescent glass dangles. Adjustable; spring ring clasp. Approx. 18"L.